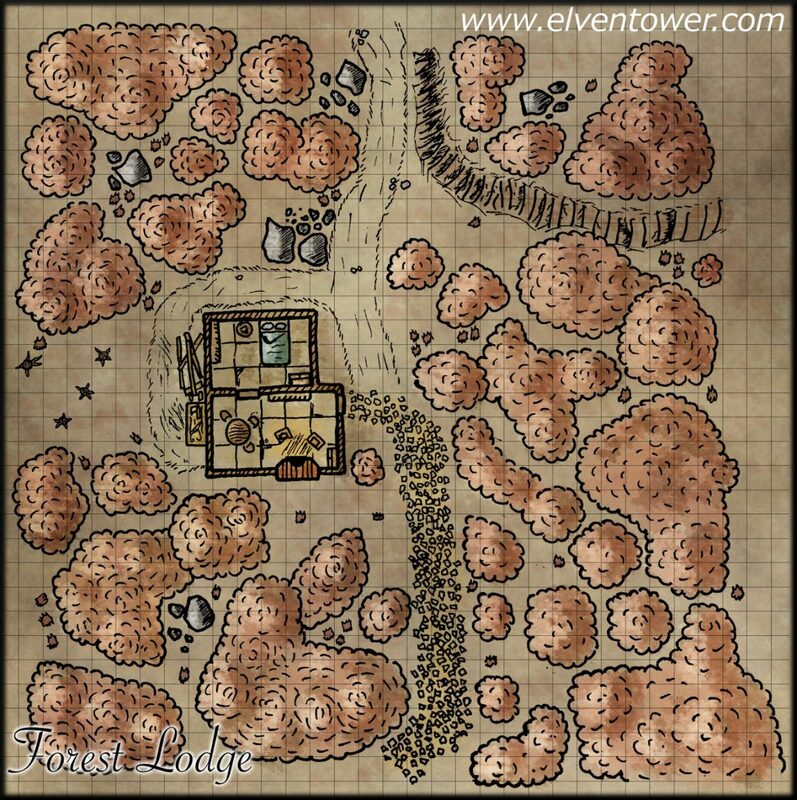 Not very deep in the forest, the elf Darimir Zunth lives in a wooden lodge that looks very ordinary. He hides a secret, a few years back, while exploring a nearby cave, he found a necklace. It has a big ruby embedded, which shines brilliantly. It is cursed, and little by little has transformed Darimir into a very different being. Now he is deranged, he lives in solitude, never abandoning the forest anymore. He fears outsiders or anyone who passes near his territory. The magic of the necklace permits him communicate with wild animals, through years, he has somehow bonded with a pack of wolves that inhabit the forest. Darimir is insane and cannot be reasoned with, if captured, he can only insult and curse the PCs. If visitors stumble upon his house, he uses the wolves pack, or his skills with the bow and poisons to kill his targets. These are not the only dangers because all around his house, he has placed bear traps to immobilize targets before killing them. The wolves know about the traps and avoid them. The bear traps are covered in grass and soil, hidden. The DM can freely choose where they are placed. They can be discovered with a passive perception of 15; or with an active Investigation check (DC 16). If a PC enters the trap’s space, the trap rolls attack +6 (3d6 piercing) and the target is restrained. The trap can be opened with a Strength (Athletics) check (DC 17) or with a Thieve’s tools check (DC 15). The cursed Necklace gives its wearer the ability to cast speak with animals 3/day. Apart from that, it slowly consumes its wearer, rendering him more wild the more time it is worn. This can be achieved with good DM-Player communication. It should be a fact to be found out slowly by the rest of the party. The Patreon release contains a map with grid for easy tactical play, a DM map with trap locations and a gridless map.